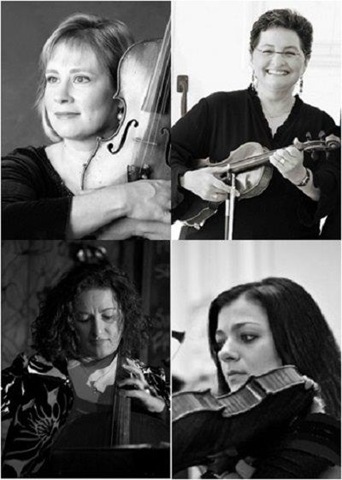 Quartet: Donna Kushner and Tara Goozee on violins, Lauren Buono on viola, and cellist Jeanne Fox. Upon entering the Dead End Café, resurrected for the Parksville Music Festival in 2013 from its hiatus as a dining/performing space while the I-86 Parksville bypass construction crew rented the facility for its headquarters for a few years, it was a joy to see people dining (the Café opens at 5:30 p.m. on Fridays and Saturdays for dinner followed by music of a variety of genres), all the tables full and people laughing and talking while they ate dinner. The happy atmosphere carried over into the performance space where the chairs were set up facing the raised stage and the beautiful “green” view outside seen through the floor to ceiling window. The Quartet began the evening with Mozart’s Divertimento # 1 in D Major, K. 136, the first of three Divertimenti written between his first and second string quartets when he was just fifteen years old. It was followed by Haydn’s Quartet in D Major, Op. 64, No. 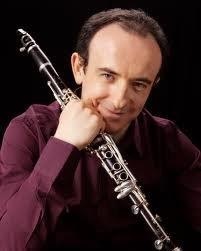 5, “The Lark,” and Beethoven’s Quartet in c minor, Op. 18, No. 4. Haydn’s “Lark” Quartet is one of the most popular of a dozen quartets that he composed in 1788 and 1790. Over a somewhat plain accompaniment, the first violin presents the birdlike melody from which this quartet takes its nickname. We know that Beethoven was greatly influenced by the quartets of Haydn and Mozart when he composed his first six quartets. For Op. 18, No. 4, in his zeal to demonstrate his individual view of C minor as a dramatic key, he forgot to write a slow movement. The outer movements are the usual Allegros, but for the second usually slow movement he composed a Scherzo-like movement followed by a Menuetto for the third movement, where most classical works would have one or the other. The three works were lovingly played by the ensemble. And speaking of joy, it was a joy to watch them interact with each other. The pleasure they all get from playing as an ensemble was visually evident as, with much concentration, they brought out and communicated all the emotion inherent in the three works: Mozart’s fun with the new-to-him Italianate Divertimento style, Haydn’s highly crafted musical structure and his interplay-dialogue between the four parts, and then a harbinger – a glimpse of the profundity of the Beethoven-to-come in his later quartets, with his intuitive knowledge of what harmonic progressions and key and modality changes can do to our senses. Interestingly, the two violinists changed chairs during the evening, with Donna Kushner (photo above left) first violinist in the first half and Tara Goozee (photo above right) as first violinist in the second half. After the concert I spoke with cellist Jeanne Fox (photo right), who, with tongue in cheek, told me they do that because they are “democratic,” and then she assured me, “no,” the cellist and violist would not follow suit! 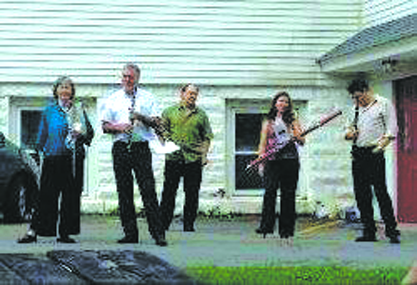 The quartet next plays outdoors during dinner at the Iron Forge Inn in Warwick (Bellvale) on July 31 at 6:30 p.m. 845-986-3411. The next Parksville Music Festival 2014 concert is on August 2 at 7:30 p.m. It will feature The Lyric Quartet, three vocalists and one pianist who will perform Opera, Broadway and Pop. Optional dinner begins at 5:30 p.m. 845-292-0400. But as you approached the village you could happily see that Main Street was shining and all was well. Until you looked up into the sky, that is, and saw that “The outlook wasn’t brilliant for the Jeffersonville 5 that day,” as clouds threatened the annual outdoor On The Lawn opening day concert for Weekend of Chamber Music’s 2014 Summer Festival in Jeffersonville. So the July 13, 2014, Weekend of Chamber Music (WCM) concert was moved indoors to the First Presbyterian Church in Jeffersonville. 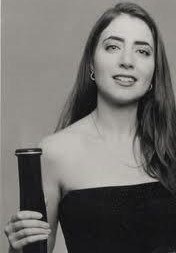 “Atlantic Crossing: Folk-inspired Music from the Old & New Worlds” is the theme of Weekend of Chamber Music’s 2014 Summer Music Festival which will continue through July 26 with programs in Jeffersonville, Bethel, Callicoon and North Branch. A pre-concert event was held in Honesdale, PA.
July 13th’s Jeffersonville program began with a “Serenade/Divertimento in C Major” by Mozart which linked the day to the classical music program of the previous evening in Parksville. It was performed (brilliantly, of course) by WCM’s wind quintet for the day, flutist Judith Pearce (photo at left with oboist Matt Sullivan), clarinetist Pavel Vinnitsky, oboist Matt Sullivan, Gina Cuffari on bassoon (and vocals) and Adam Schommer on French horn. I don’t remember how Mozart’s piece was linked to the 2014 theme, but the works that followed adhered closely to 2014’s tagline, and brought us from the 18th century into the 20th and 21st. Shortly after composing a set of “simple” piano pieces not unlike Bartók’s “Mikrokosmos,” fellow Hungarian Gyorgy Ligeti arranged them for wind quintet under the title “Six Bagatelles for Wind Quintet.” The Bagatelles were performed first in 1956, but not in their entirety: the last movement was censored by the Soviets for being too “dangerous.” The very enjoyable bagatelles are marvels of musical ideas, possibly simply conceived, but profound in their outcome. Bartok melodies followed – folk melodies from Hungary and Transylvania –examples of taking folk melodies and incorporating them into classical works by enhancing them, one of Bartok’s fortes. WCM co-artistic director Andrew Waggoner played a couple of the songs first on the piano and then the Jeffersonville 5 played the quintet arrangements. Belying poet Ernest Thayer’s 1888 poem, there was a plethora, a deluge, a profusion, a surfeit, a superabundance, YES a flood of joy in Jeffersonville as Vinnitsky performed Waggoner’s “Klezmer Melodies for the Quintet.” Aided and awesomely, ably abetted by Schommer (photo above left) on horn (and the others), Vinnitsky (photo right) thrilled the audience as he gently walked down the center aisle, bending, flexing and lightly stepping as his instrument sang, cried, kvelled and soared. The response was so enthusiastic that it had to be encored. Someone, (Waggoner? ), said – “this time faster.” All concurred, and as is fitting to Waggoner’s and his absent co-director Caroline Stinson’s proclivity and metier, Vinnitsky said he’d even do a bit of improvising. Words cannot describe the pleasure, the uplifiting, the joy felt by all in the Jeffersonville church that afternoon. 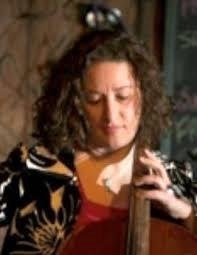 Visit www.wcmconcerts.org or www.weekendofchambermusic.com for the season’s roster which includes Pulitzer Prize winning composer-in-residence Shulamit Ran.